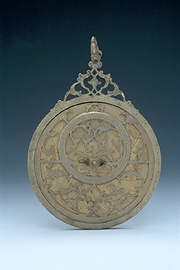 Astrolabes provide evidence for the extraordinary range of ingenuity and astronomical knowledge applied by Muslim astronomers. By simulating the rotation of the stars these instruments could be used to solve complex astronomical problems. Astrolabes found other practical applications including surveying, teaching, and astrology. Although too small for any great accuracy, they were also useful for determining the time (by day or night) and hence for fixing Muslim prayer times according to the stars. 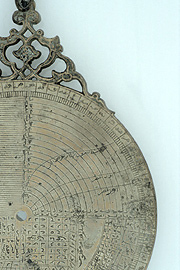 On the back of this astrolabe, the top right quadrant displays curved lines that mark the beginning and end of afternoon prayer.